The mechanics are solid and, critical for the target audience of the series, easy to learn. Tails of Equestria is a good way to introduce younger kids to tabletop RPGs. The core mechanic consists of rolling the die for the attribute or trait in question to beat a target number, ranging from Very Easy to "Has anyone ever done this?" If the target number is higher than the die can roll, the Exploding Hoof comes into play - if the die rolls its maximum, roll the next larger die and take the better roll. If the next die rolls its maximum, keep going to the next larger one until the die roll is successful or not the max. Of course, the player can choose to spend Tokens of Friendship to affect the roll; the more Tokens spent, the better the result. There are three types of ponies available to play, though supplements may provide for more. The choices are Earth Pony like Applejack and Pinkie Pie, Pegasus like Rainbow Dash and Fluttershy, and Unicorn, like Rarity and early Twilight Sparkle. Icewind, being a magical pony, will be a unicorn. Starting level is usually one, though GMs can decide to start PCs at higher levels if wanted. Just like the Mane Six, every PC has one of the Elements of Harmony - Kindness, Generosity, Laughter, Loyalty, Honesty, and Magic. The Elements are more for role-playing, though having an appropriate one may make a task easier to complete. The obvious element for a magical pony is Magic, but I'll go with Kindness instead. Every pony has to decide whether to be strong or brainy. 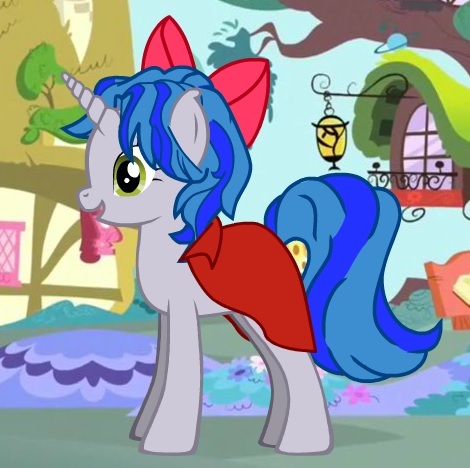 My Pony Character, being magical, opts for being brainy. What this does is determine the starting values for Body and Mind, with brainy ponies putting a d6 in Mind and brawny ponies putting it in Body. The other attribute gets a d4. Charm starts at d6 for all ponies. All ponies start with a Stamina of 10. The value is determined by taking the highest value of the die type of both Body and Mind and adding them together. Every pony gets a talent based on their Cutie Mark. In addition, the pony type also provides a talent. With the magical pony, she will get Telekinesis for being a Unicorn, and will take Creative Flair (Snow Sculptures) for her Cutie Mark talent. Both start at d6. If I were to play this pony, I`d work with the GM to create a Frost Ray talent for when she levels up, basing the ability off the Stun Ray talent. Every pony has a quirk, something that can create problems for them. Pinkie Pie has Naive and Too Silly; Rarity has Neat Freak and Fear (Nature); and Fluttershy has Super-Shy and Fear (Most Things). The Mane Six have two quirks each, but they are a much higher level thanks to all their adventures. Starting ponies only need one. For my magical pony, I`ll take Asthma*. She has trouble breathing at times, and when it prevents her from doing something, it may gain her extra Tokens of Friendship. The Cutie Mark should be related to the Cutie Mark talent, above. It doesn`t have to be a direct represention, but should imply. For my magical pony, the Cutie Mark is a triad of snowflakes of different sizes. As for the portrait, one can draw one`s pony, get a pad of character sheets, or use an online creator, which is what I did. Icewind, created at Doll Divine. The pony`s name is much like the Cutie Mark and should reflect the pony in some way. For my magical pony, I want a ice or snow type name. Snowflake doesn`t sound just right. Icewind works a little better. Ponies start with 400 bits to purchase whatever they need at the beginning and are assumed to have a job that has a salary of around 200 bits per month. Icewind works at the skating rink, helping to maintain it and teaching young colts and fillies how to skate. From her portrait, Icewind needs a cape, costing 20 bits. She also needs art supplies, 30 bits, for her snow scultping and ponybalm, 25 bits for a tube good for five uses, to help ease her asthma. That leaves Icewind 325 bits for anything she needs while adventuring. And that's Icewind complete. Character creation doesn't take long. The decisions are easy to make and allow for a wide range of possibilities. Three snowflakes of different sizes. As usual with character I create here, feel free to use Icewind but please let me know if you do play her. * Did I mention the game is also educational? Not only does it help teach math and reading skills and exercise creativity, Tales of Equestria also encourages its players to learn why people behave the way they do and figure out how to work with them. The goal of the game is to promote friendship and teamwork, just like the TV series.